Jan 20, 2015: In 2000, I was tasked with creating the convergent platform strategy for “Bridget Jones.” I was heading Entertainment for <kpe> Europe, an American digital agency responsible for building Channel 4’s e4.com. <kpe> was managing the digital properties/extensions for the book. The movie had yet to be released. It was an exciting project that not only challenged traditional tenets of storytelling but also gave us the chance to boost audience engagement, brand equity and revenues. What’s the point of cross-platform programming? Standaone properties in each of the media – film, TV, Internet and mobile devices – that are not integrated and fail to feed off of each other pose a missed opportunity. Integrated media may unify and greatly enhance brand equity and present new opportunities for advertising, sponsorship, subscription and e-commerce. With regard to Bridget Jones, we intended to not only distribute content across multiple platforms but also exploit the property across multiple channels – online and off. Why resurrect a project from 15 years ago? In Internet time, is this not ancient history? At the time, we were striving for “convergent programming” – now known as transmedia or multi- / cross-platform entertainment. By exploring the process of extending traditional content – books, films and TV – into digital properties, we began to ask questions that are as relevant today. Technology was lagging behind content in 2000. Not only were the pipes small but few people had broadband. Imagine waiting for minutes to download a large image or watch a 5-second video. Technology has caught up if not leaped ahead of storytelling. Oculus may sell thousands of VR headsets, but if there’s no content for a next-generation user experience, virtual reality remains on the shelf. THE CHALLENGE: HOW TO MAP TRADITIONAL CONTENT TO A CONVERGENT PLATFORM AND CREATE A CROSS-PLATFORM PROPERTY? What we want to explore in this blog is not a formulaic solution but a way of thinking. How do you expand a linear narrative into a multi-platform property and incorporate interactivity? 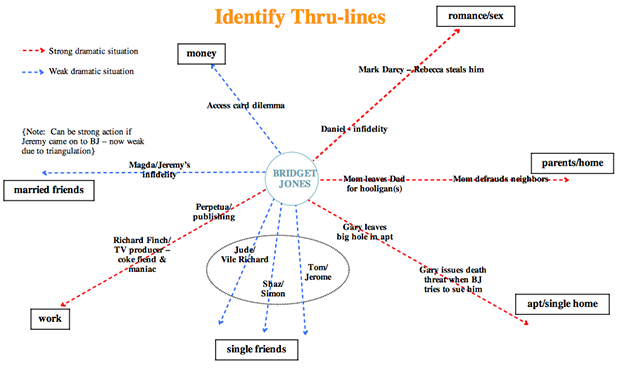 Bridget’s relationships within the dual worlds consisted of narrative ‘threads’. These threads had to be pulled out from the novel and then dramatized. From a dramatic standpoint, certain threads were stronger than others. The strong threads could be shaped/used for TV or film. Weaker threads could be strengthened by adding key dramatic elements – i.e., boosting the given set of circumstances – and distributing this content across multiple platforms. A balance must be struck between the pre-recorded (traditional programming) and the spontaneous (interactive programming). At what point do you turn over the author’s role to the user? Where lie the points of entry – TRIGGERS for a call to action from the user – in a narrative that allow for a convergent platform? 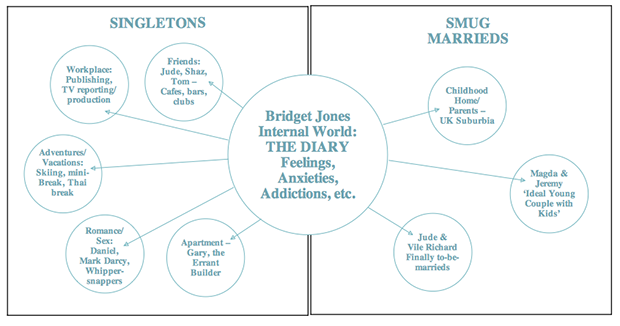 Please note that we envisioned Bridget Jones as a TV show and therefore based our assumptions on traditional episodic structure. 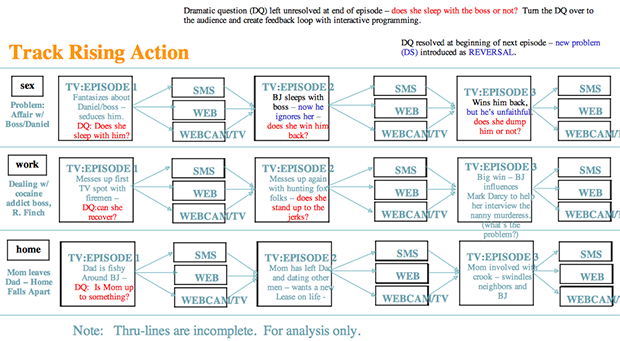 Within each episode, determine the given set of circumstances – setting, problem, character need, why now? – and the dramatic question – the cliffhanger that leaves an audience wondering what will happen next? 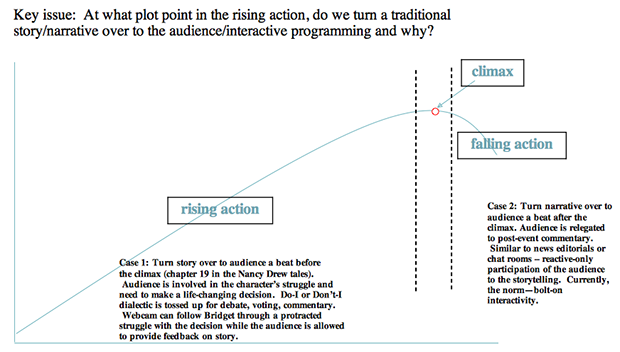 Figure out where traditional and interactive programming weave together and why – at what plot point can we break away from the narrative and not lose the power of the story and, in fact, enhance it? Once you track the rising action – the arc – of a throughline, you can figure out where to break into traditional linear narrative and introduce an interactive component. In many respects, a traditional TV show does it for you already. Because the audience is left with a cliffhanger at episode end, the writer opens the door to a spectrum of outcomes. The cross-platform component can take advantage of that opened door and feed upon the mystery. 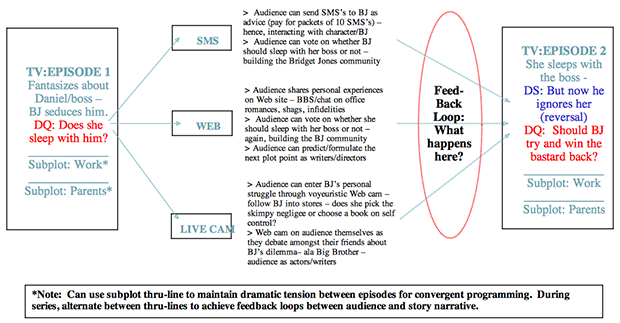 Between TV shows, the interactive component then becomes the glue, creating a feedback loop between audiences and the show’s characters and events. The more important question is once you receive audience feedback, what do you do with it? How do you incorporate a user’s choices into your programming? Deepening audience engagement, building community and extending the dramatic tension during the 11th hour is the primary goal of the feedback loop. 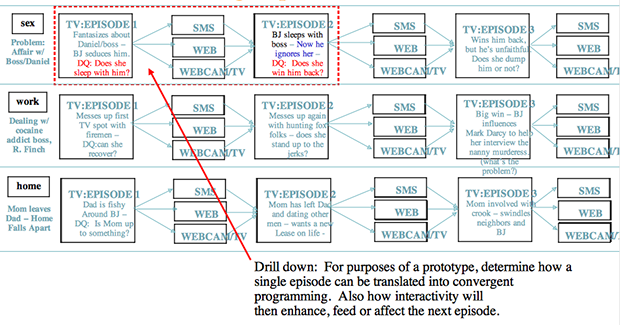 Based on these steps, we were aiming to build a functional prototype – a TV pilot and the interactive components – revolving around the world of Bridget Jones. In the 15 years that have passed, multi-platform programming has evolved and is fast-becoming the norm. As creative media artists in today’s hyper-connected world, we’re concerned with the nuts and bolts – the how-to’s – of creating cross-platform properties, and some of the old discoveries still apply.